Now with Organic Lavender Essential Oil! Experience the Difference of a Pure Oxygen Facial! OxyBalm™ is an OAW exclusive formula from our Oasis Serene Botanicals Premium Skin Care line which can be used for almost any skin condition. OxyBalm™ Ozonated Olive Oil is fantastic when used as an oxygen facial, a skin conditioner and an anti-aging moisturizer. Very popular in Europe and American high-end Spas, ozonated olive oil is used an effective skin repair serum in the form of oxygen facials. 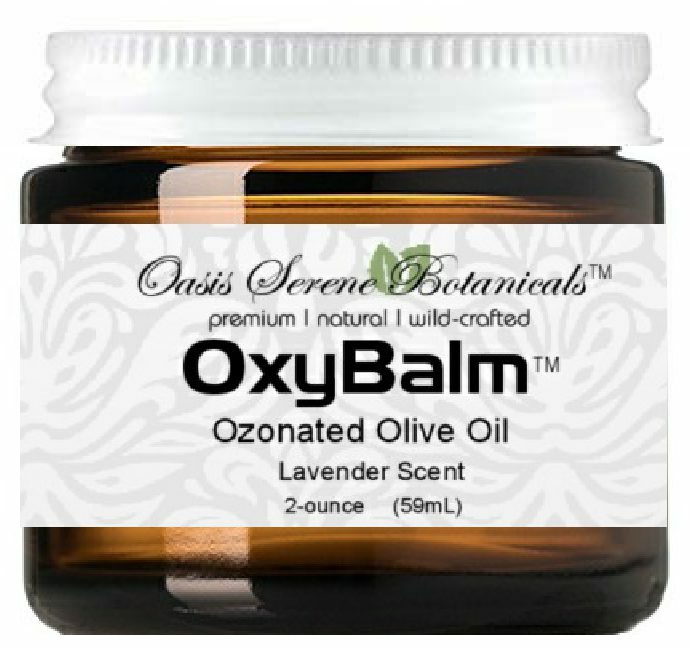 OxyBalm™ contains activated oxygen and organic, cold-pressed virgin olive oil as well as organic lavender essential oil. OxyBalm™ Ozonated Olive Oil can be used for any kind of skin condition in order to provide oxygen to the skin. Ozonated olive oil can be used for skin support in eczema, rosacea, cuts, burns and sunburn, razor burns and bumps, fungal issues (including athlete's foot), fistulae, leg ulcers, bed sores, gingivitis, herpes simplex, or hemorrhoids. At-home oxygen facials. Have you ever wanted to experience a high-end spa oxygen facial? Now you can! To use OxyBalm as an oxygen facial apply a small portion on your face (avoiding eyes) and gently massage into your skin. Place a very warm wash cloth over your face for 2-3 minutes. Remove the cloth but do not rub off any of the oil. While it's best to leave the oil on your face, it can also be wiped off after 20 minutes, if necessary. OxyBalm should not be used more then twice a week as oxygen facial. OxyBalm™ Ozonated Oil is a super concentrated oxygen infused serum containing ozonated organic cold pressed virgin olive oil and organic lavender essential oil. No stabilizers or preservatives. GMO-Free. Not tested on animals. Gluten Free. Vegan. Keep Refrigerated. OxyBalm™ naturally has the smell of ozone which is a good indicator of its strength. OxyBalm™ is not a liquid ozonated olive oil, but instead is more of a paste|serum consistency with the effect of a soothing balm. Used externally for skin conditioning. Apply 2-4 times daily as needed by rubbing into the affected areas. Some people like to use Oxy Balm™ Ozonated Olive Oil one day on and one day off for skin issues. For oxygen facials apply to face 1-2x per week. You may leave on the skin or wipe off after 20 minutes. OAW packages Oxy Balm™ in amber glass 2-ounce jars with a sealed lid. It is important that ozone not be packaged in plastic. Also a dark color or opaque jar is used in order to assure that light does not compromise the balm. Some customers express concerns about shipping the product non-refrigerated. Since ozonated olive oil has a very long shelf life even at room temperature, and we use temperatures of over 30C in the manufacturing process, a couple of days of shipping will not deteriorate the product. We do suggest that during summer months two-day shipping is chosen. Your order may arrive liquefied, but refrigeration will restore its paste consistency. OAW takes all precautions to ensure the potency of Oxy Balm™. Activated oxygen (ozone) is a natural part of the Earth’s atmosphere, and is known world-wide for its ability to destroy pollutants, viruses, bacteria and free radicals. It is widely used in the bottled water and organic foods industries for purification. Ozone is created naturally when oxygen comes in contact with ultraviolet rays emitted from the sun. Ozone is so safe it is being used in operating rooms, the organic food industry, municipal water systems, swimming pools and the list goes on and on. The beauty of ozone is that it leaves sparkling fresh water and a pathogen-free environment with only pure oxygen as a byproduct. When ozone is continuously bubbled through olive oil for an extended period of time, it is captured and preserved into the organic, cold-pressed, virgin olive oil. During this time the olive oil under goes a change to an off-white paste to form ozonated olive oil balm which is a skin-friendly product that may be used to improve the appearance of your skin. Ozonated Olive Oil may be used for skin support in eczema, rosacea, cuts, burns and sunburn, rosacea, fungal infections (including athlete's foot), fistulae, leg ulcers, bed sores, gingivitis, herpes simplex, hemorrhoids, vulvovaginitis, bee stings, insect bites, acne and any other skin related concerns. Many companies carry and sell ozonated olive oil. After much research, OAW trusts only one company's expertise—who has been making ozonated olive oil for years. OxyBalm™ from Oasis Serene Botanicals is formulated using only the finest organic cold pressed olive oil. To maintain the highest level of purity, OxyBalm is packaged using amber glass containers. No plastics or metals ever touch the oil during production to prevent the leeching of foreign chemicals or byproducts into OxyBalm. After the ozonated oil process is complete, OxyBalm is kept refrigerated in glass jars until it ships directly to you. Are any filters, preservatives or stabilizers used in the making of OxyBalm? OxyBalm does not contain any stabilizers, preservatives or fillers of any kind. All of the ingredients used are certified organic. There is no expiration date for ozonated olive oil. Some reports indicate that the balm is stable for up to 17 years when refrigerated or kept frozen. After 10 years of refrigeration, ozonated olive oil was tested by Dr. J. Hansler and found to be 98% as effective in its germicidal power. What is the difference between ozonated olive oil liquid and ozonated olive oil balm/paste OxyBalm™? When in balm form you know your oil is completely saturated with ozone (activated oxygen) and oxygen. Ozonated oil sold that is liquid has very little ozone saturation and is less effective or completely ineffective. As an example, the ratio of O2/O3 in liquid ozonated olive oil formulas can only contain up to a percentage of roughly 10%, whereas ozonated olive oil paste contains up to 50% saturated oxygen/ozone by volume. Depending on the amount of oil it can take weeks if not months to make fully ozonated oil. Different oils hold different amounts of ozone. The higher the oleic acid content of the oil the more ozone it will hold. Why is Lavender essential oil included in OxyBalm? We are pleased to be able to offer our OxyBalm ozonated olive oil with the addition of pure organic lavender essential oil. The lavender scent is not over-powering but just enough to take the edge off of the normal ozone scent and enough to be calming and relaxing. Does liquid ozonated olive oil contain Ozone or Oxygen? Mostly oxygen and maybe a small amount of ozone, but the % is quite a bit less and does not have the long time release which ozonated olive oil balm/paste does. Refrigeration is recommended for best results. OxyBalm can also be kept at room temperature of less than 75 degrees and away from direct sunlight or heat. Why is using Organic Virgin Cold-Pressed Olive Oil better than using other forms of Olive Oil? Not cut with lower quality oils like canola, soy, cotton seed, etc. Why is OxyBalm™ better than other ozonated olive oil formulas on the market? One of the most advanced and proven ozonated olive oil product on the market. OxyBalm™ contains the highest possible saturation of ozone/oxygen ever developed. Will last indefinitely when kept refrigerated. With skin application it immediately activates with body temperature to release oxygen to the skin. This release can last for 12 hours or more. OxyBalm™ ozonated olive oil serum is safe and non toxic for children and animals. This stuff is WONDERFUL!! I use it two times every week and have for several years. I use it at night – a little bit goes a long way – and the next morning my skin is very soft. Sometimes in the mornings my skin feels just a bit oily – but I have always had oily skin. My skin also stays clear. Can’t say enough good about OxyBalm.